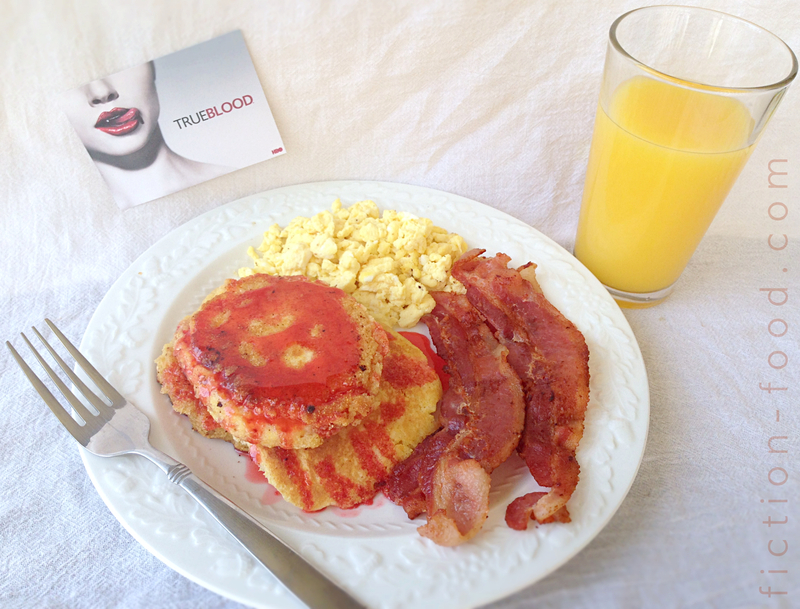 Fiction-Food Café: Hoecakes Cooked in Bacon Grease from "True Blood"
Hoecakes Cooked in Bacon Grease from "True Blood"
"When your father left I loved him with everything I had in me and I hurt for myself. So much so that I forgot to hurt for you. There were even times when I forgot to....lord have mercy on my soul. I forgot to feed you, Tara. I forgot to feed my own daughter. For days at a time I would forget. I thought I never could forgive of myself, but if you let me Tara I can make this right, for the both of us. Come here, let me feed you. Please, this whole thing, all the trouble in this world, it's a blessing, Tara, it's a chance for us to heal. Please let me feed you, let me take care of you, let me nourish my baby girl." Let's go back some more to the season 1 episode "The Fourth Man in the Fire", to the morning after Lettie Mae's drunk-demon exorcism. Tara finds her previously abusively drunk mother being productive outside tossing half empty bottles of alcohol into the trash can. Tara is astonished and having trouble believing the situation until she checks her mom's breath and smells...maple syrup? Lettie Mae: "Check the kitchen. I made Hoecakes." Tara: [entering the kitchen] "Are you serious? I haven't had hoecakes since–"
Lettie Mae: "Since your grandmama was alive? I always could make 'em, just never did. The demon never let me." Tara: [savoring the first bite] "Mm, you made these with bacon grease." Lettie Mae: "It's the only way!" Yeah baby, bacon grease. 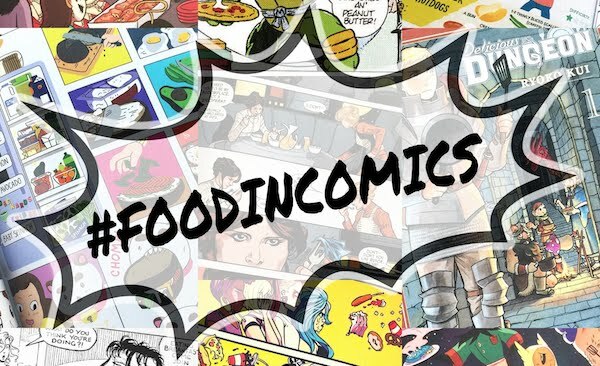 Tara and her mom have had a terrible ride for much of their lives, but two of the most significant moments they've had with each other have had something to do with food. For Lettie Mae and Tara both, the hoecakes harkened to a time before the years of drunken abuse, and then forward to a life of belief that good things can come. Lettie Mae's more recent offering of her own blood, being so full of regret for not providing more meals (hoecakes!) for her child when Tara was human–along with all that providing meals for a child encompasses (love, care, sacrifice of time, etc. )–was an ultimate repentance in the fact that she was literally giving Tara all of herself, making herself completely vulnerable to the person she had hurt so deeply. And Tara accepted. So in honor of Tara and Lettie Mae and the scarred but strong bond they share I present to you an uber easy hoecake recipe (two actually, see the note below) with a side of strawberry maple syrup "blood". Note: Hoecakes, named so for once being baked on either hoe blades or a type of pan called a hoe, date way back to the early Native Americans (maize, yo) and have been cooked up and down the east coast and then some by peeps who can at least afford corn meal. The super basic hoecake recipe that you can try is 1 cup fine ground cornmeal + 1 cup boiling water. Stir it up with 1 Tbsp. butter and 1/2 tsp. salt until it's a nice soft mush. Form it into patties and fry them in bacon grease until golden. They taste like corn chips. The recipe below though, while just as easy, has a bit more flavor and texture. 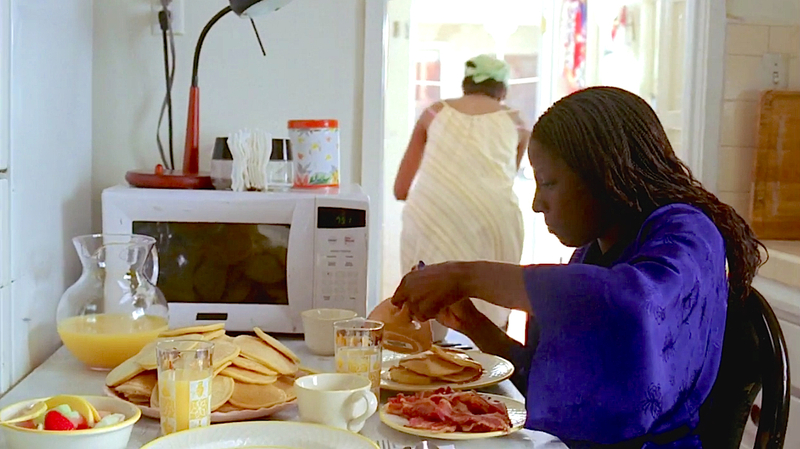 Also FYI, in s.3, ep.6 of "True Blood" Sam Merlotte's mom Melinda makes him a batch of hoecakes cooked in bacon grease, or corn fritters as she calls them, and then in s.3, ep.12 Sam makes some hoecakes for Tara, attributing his knowledge of how to make them to his mom and says, "it's all about the bacon grease." Yeah boyee. 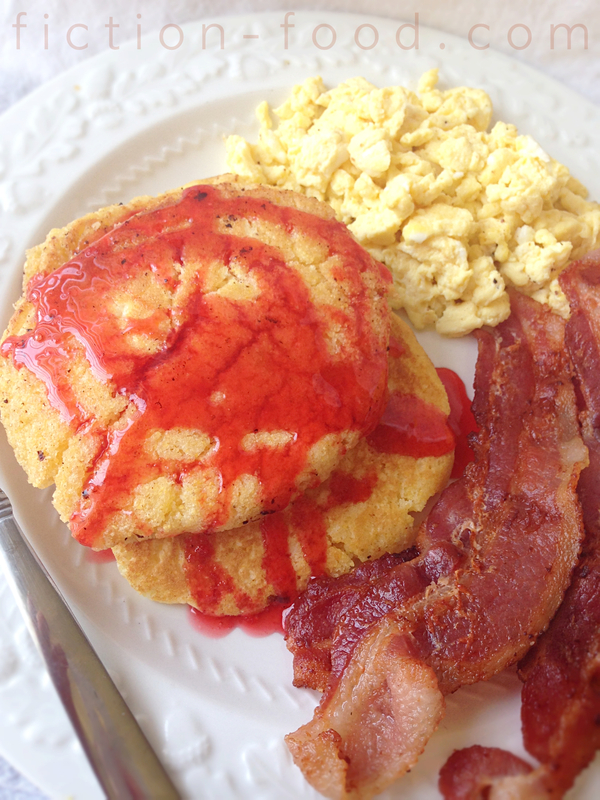 Lettie Mae's Hoecakes w/ Maple "Blood"
1. Pour the syrup into a microwave-safe bowl or cup & sprinkle in enough strawberry jello powder to make a pretty, deep red when stirred. Zap for 30 seconds in the microwave & stir again. If the powder isn't dissolved, microwave for another 30 seconds. Stir & let cool in the fridge until ready to use. 2. Fry the bacon in a large pan over medium-high heat. While it's cooking combine the corn muffin mix with the called for amount of milk or substitute with buttermilk (that's what I did). Stir until you've got a smooth mush. 3. Once the bacon is done how you like it, shake each piece over the pan as you remove it so the excess grease can fall back into the pan. Drain the bacon on a paper towel-lined plate. Turn heat to medium & swirl/spread the bacon grease around (if you want you can pour the grease into a liquid measuring cup & then pour it back into the pan in increments when needed while frying the cakes). Spoon corn batter into the pan to make a few 4" patties, mindful not to crowd the pan too much. Cook for several minutes, until the bottoms are golden & the tops are a little bubbly. Very carefully flip each cake & cook again to golden brown. Carefully remove the cakes to a plate & repeat the process until there's no batter left. 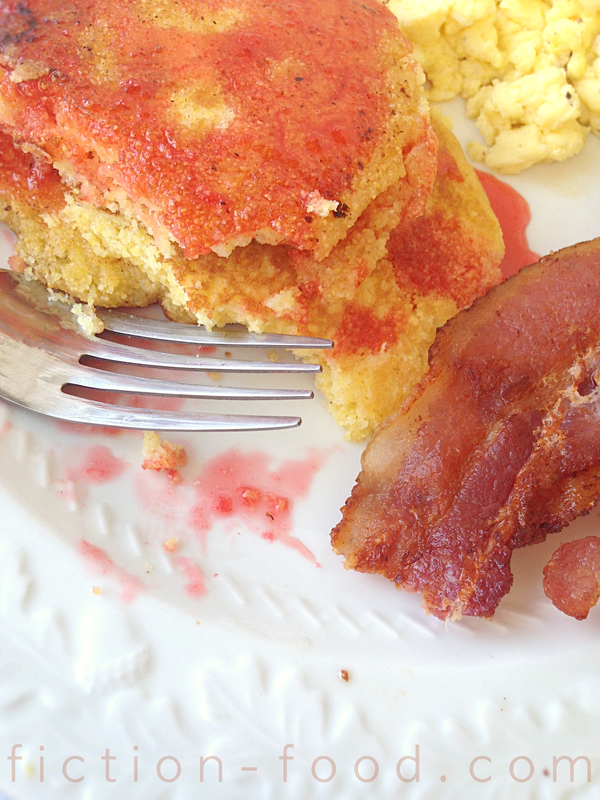 Serve hoecakes with bacon, scrambled eggs, & orange juice. 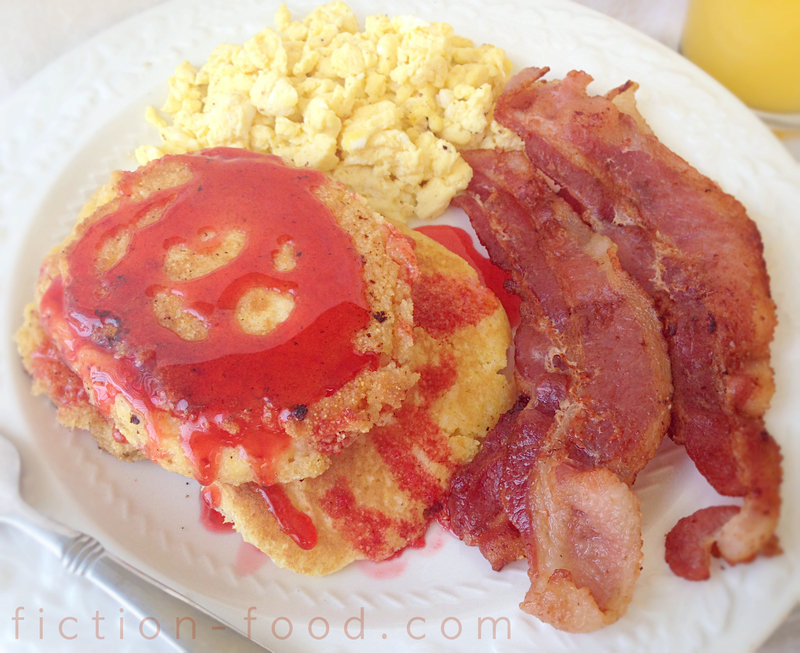 Just before eating, pour strawberry "blood" syrup over the hoecakes.